Niches on the second floor of the Natural Capital Center. 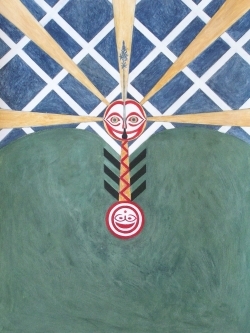 With the belief that the whole is greater than the parts, Ecotrust is working extensively to build partnerships with the Portland art community and offers its niche and display space to Salmon Nation Artists. We seek to offer dynamic, vibrant shows that will provide a different way for the community to engage and interact over issues of sustainability and the emergence of the conservation economy. 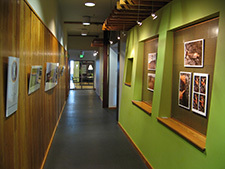 On the second floor of the Jean Vollum Natural Capital Center, Ecotrust offers several Interpretive Niches for public outreach and communication. These display spaces are recessed into the wall, measuring about four feet and are made of wood, cork, and salvaged piping from the original warehouse. Since opening these niches have rotated displays every 2–3 months and have offered information regarding Green Building, Stormwater Management, Sustainable Forestry, as well as several other topics. We invite artists to submit work for consideration to be displayed at the Jean Vollum Natural Capital Center. We encourage artist to not only consider the topic, but also the materials used in the construction of their pieces. We are currently accepting proposals for the 2008 calendar year. To submit a proposal or see specifications and guidelines, please download and complete the exhibitor application.